Product prices and availability are accurate as of 2019-04-23 21:55:39 EDT and are subject to change. Any price and availability information displayed on http://www.amazon.com/ at the time of purchase will apply to the purchase of this product. "I have discovered a truly marvelous demonstration of this proposition which this margin is too narrow to contain." With these words, the seventeenth-century French mathematician Pierre de Fermat threw down the gauntlet to future generations. What came to be known as Fermat's Last Theorem looked simple; proving it, however, became the Holy Grail of mathematics, baffling its finest minds for more than 350 years. In Fermat's Enigma--based on the author's award-winning documentary film, which aired on PBS's "Nova"--Simon Singh tells the astonishingly entertaining story of the pursuit of that grail, and the lives that were devoted to, sacrificed for, and saved by it. Here is a mesmerizing tale of heartbreak and mastery that will forever change your feelings about mathematics. When Andrew Wiles of Princeton University announced a solution of Fermat's last theorem in 1993, it electrified the world of mathematics. After a flaw was discovered in the proof, Wiles had to work for another year--he had already labored in solitude for seven years--to establish that he had solved the 350-year-old problem. 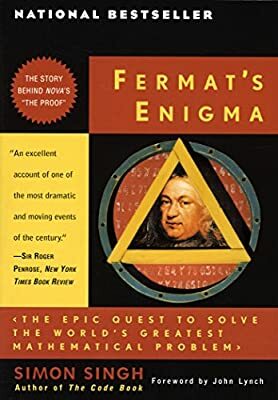 Simon Singh's book is a lively, comprehensible explanation of Wiles's work and of the star-, trauma-, and wacko-studded history of Fermat's last theorem. Fermat's Enigma contains some problems that offer a taste of the math, but it also includes limericks to give a feeling for the goofy side of mathematicians.